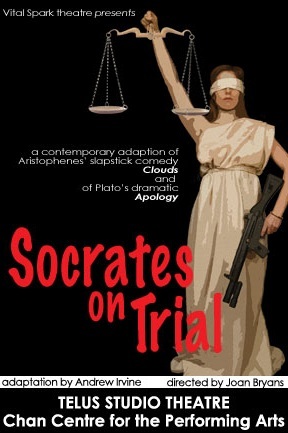 SOCRATES ON TRIALis an abridged adaptation of several classic Greek works: Aristophanes’ slapstick comedy,Clouds, which was first performed in 423 BCE; Plato’s dramatic monologue,Apology, which reports the speech Socrates gave to the jury after he was charged with corrupting the young and failing to honour the city’s gods; and Plato’sCritoandPhaedo, two dialogues leading up to Socrates’ execution in 399 BC. In Act 1, which is part biting satire, part vulgar gossip and part bawdy vaudeville show, Aristophanes ridicules the influence teachers like Socrates have on the young. In Act 2 and Act 3, Socrates will do his best to explain why he thinks he hasn’t been a corrupter of the young, and how he think Aristophanes has distorted the truth for the sake of a few cheap laughs. During an Athenian trial, juries weren’t quiet. If people thought someone was stretching the truth, they wouldn’t hesitate to yell out.